Ferman Foy COLLIER "Jr" [Parents] was born on 4 Aug 1955 in Ada, Pontotoc, Oklahoma. Ferman married Patsy Louise BATA on 5 Aug 1988 in Wichita, Kansas. The marriage ended in divorce. Patsy Louise BATA was born on 3 Nov 1953 in , Wichita Falls, Texas. Patsy married Ferman Foy COLLIER "Jr" on 5 Aug 1988 in Wichita, Kansas. The marriage ended in divorce. Terry Leyon DIEDRICH. Terry married Charlotte Sue COLLIER. Charlotte Sue COLLIER [Parents] was born on 17 Oct 1959 in Henryetta, Okmulgee, Oklahoma. Charlotte married Terry Leyon DIEDRICH. Phillip Michael "Mike" COLLIER [Parents] was born on 21 Feb 1961 in Oklahoma City, Oklahoma, Oklahoma. Phillip married Penny EAVES. The marriage ended in divorce. Penny EAVES. Penny married Phillip Michael "Mike" COLLIER. The marriage ended in divorce. Joshua Scott COLLIER was born on 22 Jul 1982. Mr. MC INTIRE. Mr. married Joyce MC INTIRE. Joyce MC INTIRE was born about 1960. Joyce married Mr. MC INTIRE. BURNS. BURNS married Joyce MC INTIRE. Joyce MC INTIRE was born about 1960. Joyce married BURNS. RILEY. RILEY married Patsy Louise BATA. Patsy Louise BATA was born on 3 Nov 1953 in , Wichita Falls, Texas. Patsy married RILEY. John JONES "IV" [Parents] was born in 1706 in , , Wales. He was christened on 27 Jan 1706 in Grosmont, Monmouth, England. He died in 1754. John married Elizabeth HORN before 1726. Elizabeth HORN was born in 1710. Elizabeth married John JONES "IV" before 1726. M i Lewis JONES was born in 1724. He died in Jan 1749. M ii John JONES "V" was born on 11 Sep 1726. He died in 1759. F iii Ann JONES was born on 14 Feb 1728. M iv Adam JONES was born about 1730. He died in 1791. M v Anthony Solomon JONES was born on 12 Aug 1731. He died in 1808. F vi Elizabeth JONES was born on 15 Jan 1733. M vii William JONES was born on 15 Sep 1736. He died on 16 Feb 1818. Daniel John JONES "III" [Parents] was born in 1670 in , , Northern Wales. He was christened on 25 Oct 1668 in Staplehurst, Kent, England. He died on 19 Mar 1727 in Waterford Twp, Gloucester, New Jersey. Daniel married Ann PRITCHARD on 29 Oct 1699 in Philadelphia, Philadelphia, Pennsylvania. Ann PRITCHARD [Parents] was born in 1675 in , Wales. She died on 18 Oct 1742 in Waterford Twp, Gloucester, New Jersey. Ann married Daniel John JONES "III" on 29 Oct 1699 in Philadelphia, Philadelphia, Pennsylvania. M i Henry JONES "Sr" was born in 1696. He died on 11 Feb 1749. F ii Mary JONES was born in 1698. M iii Benjamin JONES was born about 1699. M iv Lewis JONES "Sr" was born on 2 Jul 1700. He died in Mar 1763. F v Ann JONES was born on 2 Jul 1700. She died in 1748. F vi Rebecca JONES was born in 1702. Edith JONES was born in 1704 in , , Wales. M viii John JONES "IV" was born in 1706. He died in 1754. Sarah JONES was born in 1708 in , , Wales. Elizabeth JONES was born in 1710 in , , Wales. Daniel John JONES "III" [Parents] was born in 1670 in , , Northern Wales. He was christened on 25 Oct 1668 in Staplehurst, Kent, England. He died on 19 Mar 1727 in Waterford Twp, Gloucester, New Jersey. Daniel married Florence about 1690. Florence was born about 1670. Florence married Daniel John JONES "III" about 1690. Richard JONES was born about 1692. Dr. John JONES "II" [Parents] was born in 1638 in King George, King George, Virginia. He died on 19 Jan 1727 in St. Pauls Parish, Stafford, Virginia. John married Mary STILES in 1665 in King George, King George, Virginia. Mary STILES [Parents] was born in 1644 in King George, King George, Virginia. She died in 1726 in King George, King George, Virginia. 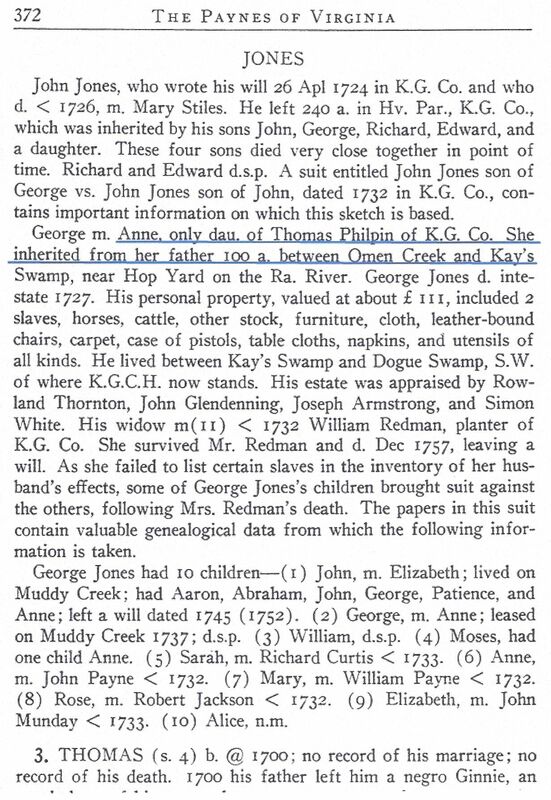 Mary married Dr. John JONES "II" in 1665 in King George, King George, Virginia. Mary JONES was born in 1666 in Westmoreland, Pennsylvania. She died in 1743 in Westmoreland, Virginia. M ii Daniel John JONES "III" was born in 1670. He died on 19 Mar 1727. M iii Richard JONES was born in 1670. He died in 1727. M iv George JONES "Sr" was born in 1670. He died in 1727. Edward JONES was born in 1672 in King George, King George, Virginia. F vi Hannah JONES was born in 1674. M vii David JONES was born about 1676. F viii Mary JONES was born in 1682. M ix Thomas JONES "I" was born in 1685. He died in 1755. Elizabeth JONES was born in 1686 in All Hallows Paris, Anne Arundel, Maryland. She died in 1773 in , Anne Arundel, Maryland.